Eighty-eight men set off from beneath the ramparts of Alicante's Castle of Santa Barbara, but only 36 would journey the full 37,000 miles to finish in the White Nights of St Petersburg. Japan's Black Tide, brutal weather, injuries and even the credit crunch all took their toll. This is the story of the Volvo Ocean Race 2008-2009, ripping and roaring through seven seas - from Spain, past Africa and on to Asia, round the Americas and back to Europe. It's a story of endurance, deprivation and adventure, a story of winners and losers, those who made it and those who didn't. 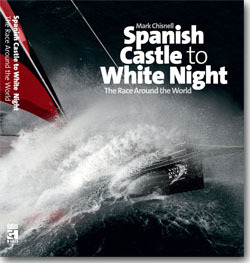 Also includes a DVD containing 2 hours and 35 minutes of spectacular footage of the Volvo Ocean Race 2008-2009, produced by Volvo Event Management. The author, Mark Chisnell, has combined writing and professional sailing for over 20 years, publishing nine works of fiction and non-fiction, and contributing to some of the world's leading magazines and newspapers, including Esquire and the Guardian. He has also won three offshore sailing world championships, and sailed as navigator with six America's Cup teams. Het boek was snel in huis, netjes verpakt. Een mooi boek om cadeau te doen aan een zeilliefhebber! Super dat ik dit nog kon bestellen! Zeer moeilijk verkrijgbaar.